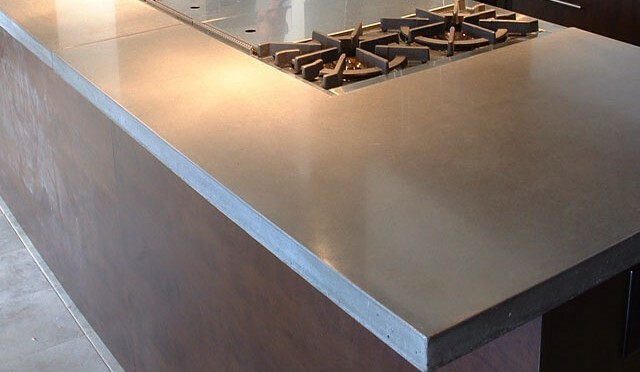 Concrete countertops are a major design trend in kitchens, bathrooms and outdoor living areas for residential or commercial spaces. The enCOUNTER concrete countertop system was designed with the DIY enthusiast in mind, providing an easy-to-install, unique and customizable countertop surface that can complement any aesthetic, while remaining strong, durable and resistant to heat, oils, chemicals and wear. EnCOUNTER is a factory-blended concrete countertop mix system, ensuring consistency. This mix can be applied with pre-cast or cast-in-place methods, and reaches a strength of 8,870 psi; that’s nearly three times the strength of average concrete! EnCOLOR is the concrete coloring component of the enCOUNTER system, available in a wide variety of colors. The enCOLOR system comes conveniently pre-packaged in small tubs of concentrated liquid color, which are added to the concrete mix at specific levels, depending on the color desired. The enCOUNTER system can also be customized using traditional water-based stains, acid stains and concrete dyes. The versatility and convenience of the entire enCOUNTER system makes it easy for the DIY consumer or professional contractor to install flawless custom concrete countertops on each and every application.